Getting a pool is a big investment. Don’t settle for just any old pool you pick out of a catalog. Work with a Mesa custom pool builder to get the pool of your dreams, with all the features you want and the exact look you want. You can have a pool like you see in some of the mansions of the rich and famous, even if you don’t have the bankroll for the real estate. There are hundreds of options for your custom pool. You can’t know what you want without first exploring what’s possible, and you can’t possibly know all of the options. So you’ll need to spend some time exploring pool designs and features. Create a look book of ideas that you like as you go along. You can easily do this with some Pinterest boards that you share with your Mesa pool builder (or that you pull up during your consultation). Or you can use another program or method that you find easier to manage. Save any designs that you like, specific pool features, types of tile, mosaic designs, and more. You can even save pictures of landscapes or architecture that inspire you. The more pictures you can show your pool builder, the better. Pools are made of a variety of materials, including concrete, fiberglass, and vinyl. They also have different cleaning and filtration systems and other features. It is important that you research these more technical aspects of pools so that you understand how each will impact the investment you make. Some are easier to clean, and some have a longer life span. You don’t have to know everything about pools before you sit down for your consultation, but you should have a working knowledge so that your conversations can be more productive. Your pool builder will happily answer any questions you have and fill in the information you need to know about pool types and features. You want to swim in it, yes, but you need to know more. Do you plan to have big parties with your neighbors frequently? Will there be a lot of kids swimming in the pool, or will adults be using it for relaxation and exercise? Do you want to tan by the pool? Will you be serving drinks and food by the pool regularly? Will you swim at night? Your pool needs to be cleaned regularly. That means putting the right chemicals in it, using the right filter, and manually cleaning it. You may also need to heat or cool the pool, perform maintenance on the patio or deck area, and more. Make sure you have a clear understanding of how much maintenance is involved so you know the time and costs. You can make choices that will make your pool more eco-friendly, which will also make the pool safer for your family and less expensive to maintain. For example, some pools can be designed to use plants for filtration instead of chemicals. Others use energy-efficient designs and technology to reduce the electricity required to maintain them. Research the options and talk to your pool builder to find the right balance between environmental consciousness and your budget. Whether you have children or not, your pool should be designed with safety in mind. Others can wander into your yard, which could make you liable for accidents. Your pool should be gated or otherwise protected against accidents involving children, pets, and even adults. You can use covers, fences, or even alarms that let you know when someone enters. Other safety measures include having life rafts available, posting appropriate signage, and reducing slippery surfaces. The pool itself is not all you should focus on in your design planning. You should also include the area around the pool, such as the patio or deck. You can include features like tanning ledges, a bar, or even pool-side water fountains. The area around the pool should be designed to enhance the functionality of the pool and to bridge the design between the yard and your home. The right landscaping can elevate your pool’s profile and make your backyard look like an oasis. Make sure you include landscaping in your pool design planning. Your pool builder should be able to include the landscaping work or should have a relationship with a landscaper they can recommend. Save ideas for landscaping in your pool design look book. Building a custom pool in Mesa, AZ is exciting and a great addition to your Mesa home. 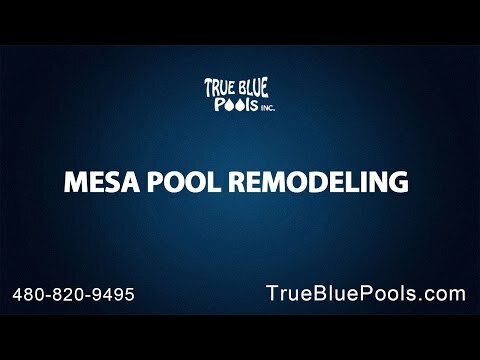 Make sure you get the most out of the new Mesa pool installation process by doing some of this prep work before you sit down with your pool builder. True Blue Pools is ready to help you bring your dream pool to life in Arizona. We can help you create a gorgeous pool design that is unique to your home, or we can help you create your own version of a celebrity pool that you admire. We also design and install extras like water bars, fountains, fire pits, and more. Contact us today to start your consultation with a friendly and experienced AZ pool builder who will help you learn more about the amazing options available. You still have time to have your pool built for this swim season!